(Amisom)- Mogadishu, 31 July 2017 – The African Union Mission in Somalia (AMISOM) has feted a contingent of Formed Police Unit (FPU) from Uganda who have completed one year of service in Somalia. 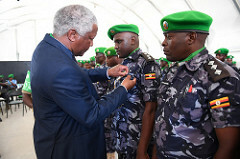 The officers were decorated with African Union medals and awarded certificates in recognition of their commitment to restoring peace in Somalia. The ceremony held in Mogadishu was witnessed by senior military and police officers who included AMISOM Force Commander, Lt. Gen. Osman Noor Soubagleh, AMISOM Police Commissioner, Anand Pillay and Uganda Deputy Ambassador to Somalia, Maj. Gen. Nathan Mugisha. Also present were AMISOM Deputy Police Commissioner, Christine Alalo, and the Director of Peace Support Operations in the Uganda Police Force, Grace Turyagumanawe. “Members of this unit have been exemplary, diligent, committed and dedicated in their selfless service to humanity in the quest to attain sustainable peace in Somalia. Furthermore, the officers and men of the Uganda FPU are highly commended for the adherence to the core values of the African Union, some of which are respect for diversity and teamwork, transparency and accountability, integrity and impartiality, efficiency and professionalism,” Maj. Gen. Fidza Dludlu, the AMISOM Head of Mission Support said in his remarks. He praised the FPU contingent for their hard work during the electoral process which concluded early this year. Gen. Fidza’s remarks were echoed by the AMISOM Police Commissioner. “One of the highlights of their presence and achievements while they were deployed was the successful conclusion of the parliamentary and presidential elections that took place in Somalia,” Brig. Gen. Pillay noted. The police officers especially the Formed Police Units were tasked to support the Somali Police Force in securing the electoral process and inauguration of the elected President. Maj. Gen. Nathan Mugisha, the Deputy Ambassador of Uganda to Somalia concurred that the officers had played a major role in Somalia’s parliamentary and presidential elections. “You have done AMISOM proud, by accomplishing your task which has not been that easy. We recall that you have done a lot of mentoring; passing on the skills that you have, on to our brothers and sisters in Somalia,” the ambassador stated. The AMISOM Police component is mandated to provide operational support to the Somali Police to help it build the necessary capacity to perform policing functions to internationally acceptable standards. Some of the duties performed by the FPU personnel, in conjunction with the Somali Police, include community policing, counter-terror operations, public order management, explosives disposal, and cordon and search operations, among others. The outgoing team will be replaced by Uganda’s sixth FPU contingent, under the command of Superintendent of Police (SP) Denis Anywar. Uganda is one of the Police Contributing Countries in Somalia. Others are Kenya, Nigeria, Ghana, Sierra Leone and Zambia.